A slip, trip, and fall is never planned and can wholly disrupt a Pembroke Pines family’s way of life. Identifying the cause or appropriate defendants can be an elusive task and compounded when dealing with insurance companies to secure financial relief for your injuries. At the Shiner Law Group, we level the playing field by aggressively advocating on your behalf. We understand you want to get your life back in order, so we pursue the best results and provide sound legal solutions to help you obtain the financial compensation you deserve. 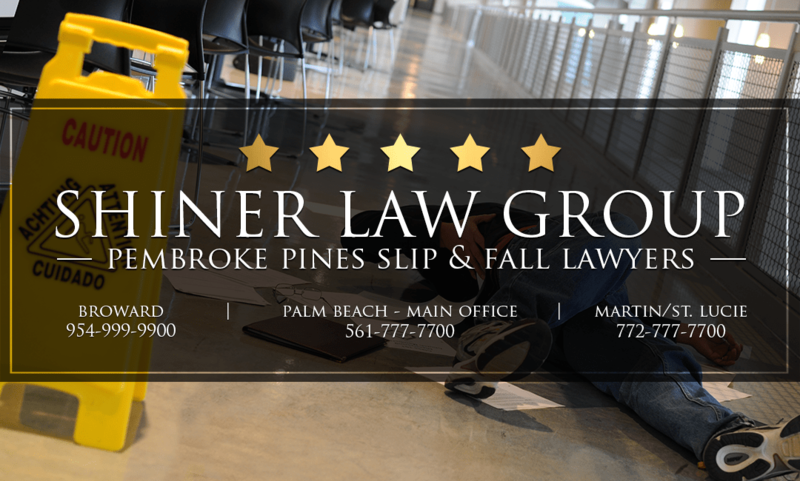 If you or your loved one has been injured in a slip, trip, and fall accident, contact our experienced Pembroke Pines slip and fall lawyers to discuss your legal rights and options in a free consultation, as you may be entitled to financial recovery. Successful litigation in a slip, trip, and fall case rests with the prompt gathering, examining, and preservation of evidence, which makes securing legal representation imperative to pursuing a personal injury claim against legally sound defendants. Slip, trip, and fall accidents can have lasting impacts on you and your family, so delays in obtaining medical treatment or legal counsel can negatively impact your ability to receive fair and just compensation. Slip, trip, and fall cases fall under the umbrella of premises liability cases, which requires residential and commercial property owners to maintain their premises in a safe and reasonable manner. While accidents may not be intentional, slip and fall victims can hold parties liable for their negligible behavior. In a Florida slip and fall legal proceeding, claimants must show that a legal duty of care was owed and that the property owner’s breach of duty, such as failing to remedy dangerous conditions, provide appropriate maintenance or repairs, or notify the public, directly caused the injuries sustained. The statute of limitations for pursuing a personal injury legal cause of action against an at-fault party is four years in the state of Florida, or two years in cases of wrongful death. Traumatic brain injuries (TBIs), concussions, seizures, mood changes, and cognitive impairment. Back injuries, spinal cord injuries, paralysis, as well as other neurological and sensory impairments. Broken bones, shoulder pain, joint pain, and bruising. The slip and fall accident lawyers at the Shiner Law Group help victims pursue a broad range of damages for their injuries, including, but not limited to, pain and suffering, medical treatment and rehabilitation, lost income and benefits, reduced earning capacity, periods of disability, and a permanent inability to engage in gainful employment. With over 15 years’ experience representing thousands of victims and their families in Pembroke Pines, we have recovered millions of dollars in settlements and verdicts because we are committed to helping our clients get their lives back. We conduct a thorough and independent investigation of the facts, customize our legal services, provide effective client communication, and employ innovative litigation strategies to help you build the most compelling claim. Our seasoned law firm focuses on the complex legal hurdles, so you can focus on what’s most important – your recovery.